Dogs and travel is an unavoidable topic for pet owners. Sooner or later, there comes a time when your canine companion needs to come along for the ride, whether it's just a routine trip to the vet's or the annual family road trip. How successful these outings are depends on the preparations you make for the journey. When your pet's needs are considered and planned for ahead of time, you've already met half the challenge. The other half relies on conditioning your dog to be comfortable with the means of transportation. Crates, carriers, and car seats - No pet should ever travel unrestrained. It's as much for your safety as it is for your pet. 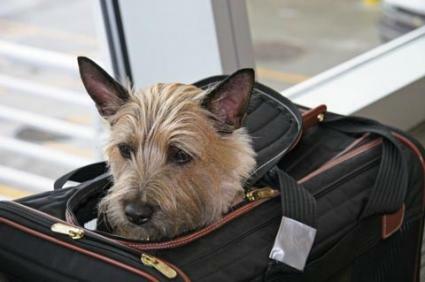 Air travel - If ever there was a mode of dog travel designed for complications, this one is it, but following guidelines will help you find your way through all the regulations, including information about pet quarantine. Pet friendly hotels - These hotels and motels can be essential when you and your dog hit the open road together. Dog boarding - Since there are times when you simply can't take you furry friend with you, we'll show you what to look for in a reputable dog boarding kennel or in-home pet sitter. Traveling with your pet isn't always easy, but in the end, isn't it worth it to have your best friend by your side?